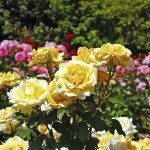 In this article, we will take a look at two classifications of roses, the Floribunda rose and the Polyantha rose. When looking up the word Floribunda in the dictionary you will find something such as this: New Latin, feminine of floribundus — flowering freely. Just as the name suggests, the floribunda rose is a beautiful bloom machine. She loves to bloom with clusters of beautiful blooms with several of her blooms in flower at one time. These wonderful rose bushes can put forth blooms that are much like those of the hybrid tea or can have flat or cup shaped blooms. 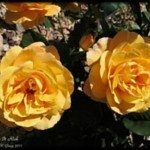 The floribunda rose bushes make marvelous landscape plantings due to their typically lower and bushy form — and she loves to cover herself with clusters or sprays of blooms. Floribunda rose bushes are typically easier to care for as well as being very hardy. Floribundas are very popular largely because they seem to be continually in bloom during the season versus the hybrid tea, which blooms in cycles that spread out the periods of being in bloom by about six weeks. The polyantha rose bushes are usually smaller rose bushes than the floribunda rose bushes but are sturdy plants overall. The polyantha roses bloom in large clusters of small 1-inch diameter blooms. The polyantha rose bushes are one of the parents of the floribunda rose bushes. The polyantha rose bush’s creation dates back to 1875 – France (bred in 1873 – France), a polyantha rose bush named Paquerette, which has beautiful clusters of white blooms. The polyantha rose bushes were born from the crossing of wild roses. 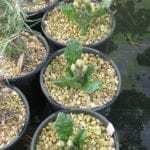 The Seven Dwarfs polyantha roses were introduced in 1954, 1955 and 1956. Some of these are available as polyantha climbing rose bushes as well.